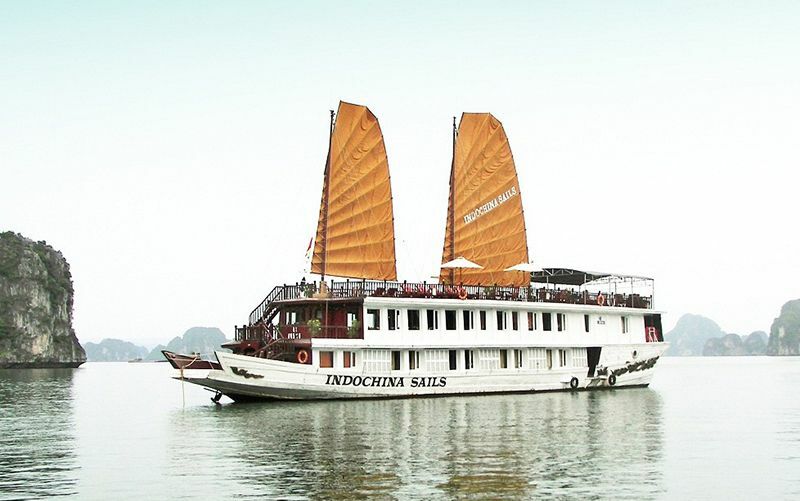 Indochina Junk is the only company that has full permission and experience to make a unique trip to the less visited area in Bai Tu Long Bay. While Halong bay center is full of tourists now, Bai Tu Long Bay remains a less touristy area. 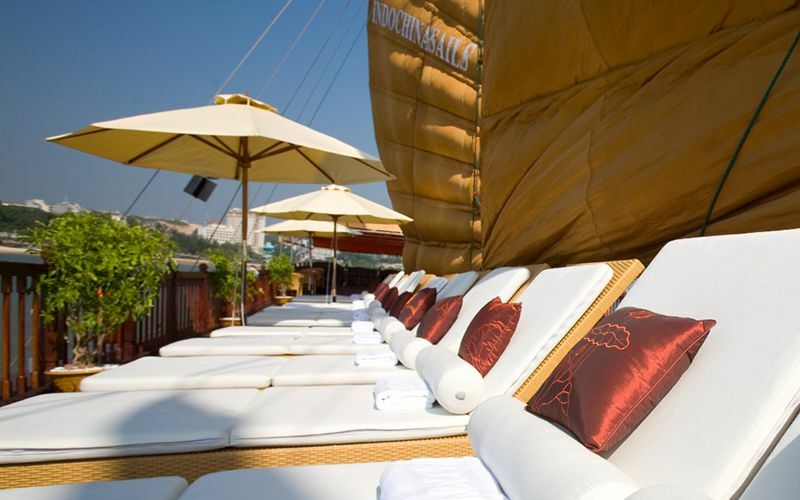 Our private junk by traditional wooden junks at high standard is served by friendly staffs and unique service and. Come with us, you never feel upset! 12.30 – 13.00: Check-in, enjoy welcome drink, cruise and safety briefing. 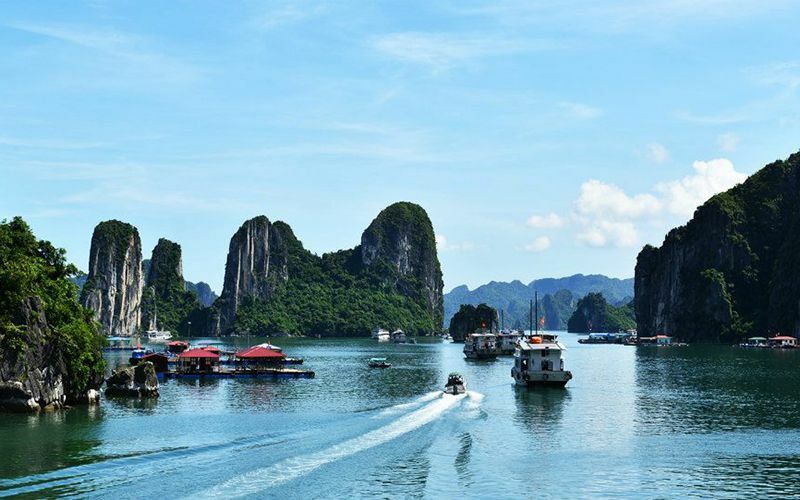 13.30 – 14.30: Have set menu lunch in the outdoor dining room (depending on the weather condition) while cruising to magnificent Bai Tu Long Bay; admire the fascinating formations on the way. 15.00 – 15.45: Visit Vung Vieng fishing village by a rustic row-boat, meet the local people and pass through the floating school and fish farms. 15.45 – 17.30: Enjoy a cooking class while cruising to Vụng Đâng. 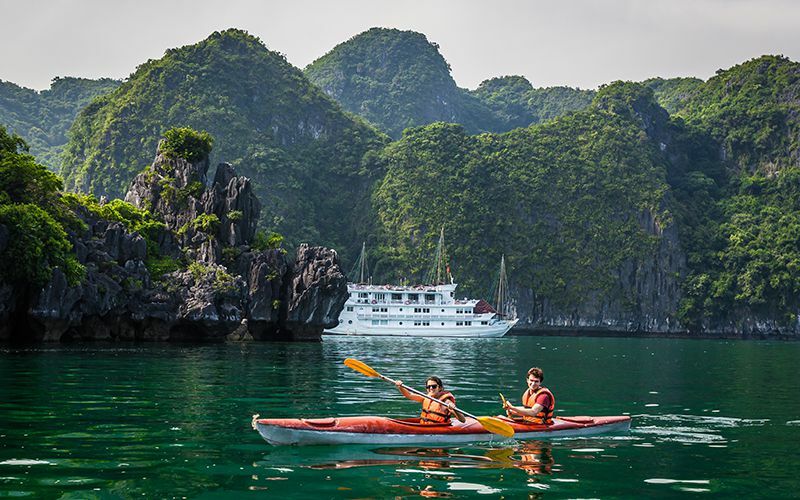 Relax or swim on a white sandy beach, go kayaking through the mystery Karst Mountains. 18.00 – 20.30: Back to junk for refreshing yourselves in the outdoor or indoor Mineral Seawater Pool, Fitness Room or the Spa and Massage Treatments before having A La Carte dinner on board. 06.30 – 07.00: Start a new day with Tai Chi demonstration on the sun deck. 07.00 – 07.30: Morning view of Bay’s landscape with a cup of tea or coffee. Have breakfast in the fresh air. 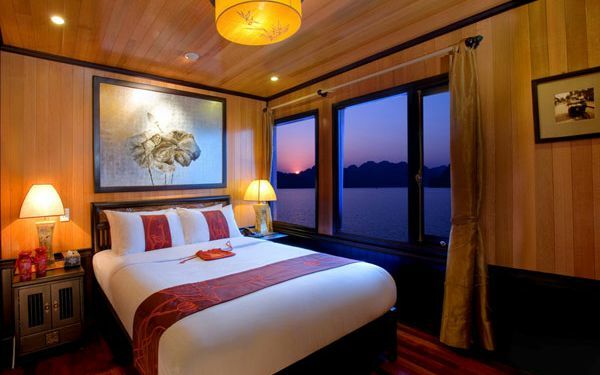 07.30 – 09.45: Cruise to Cống Đỏ & explore the well- hidden Thien Canh Son Cave. 10.15 – 11.30: Check out and pack your luggage. Start cruising towards the harbor while a Buffet is served. 11.30 – 12.00: Disembark. Farewell.